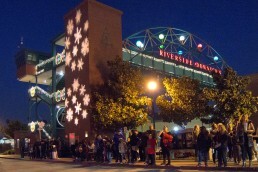 On Friday, Dec. 7, the City of Riverside and the Southern California Association of Governments’ (SCAG) Go Human campaign will encourage visitors to walk to the Festival of Lights from the Downtown Riverside Metrolink Station to experience Illuminate Riverside. 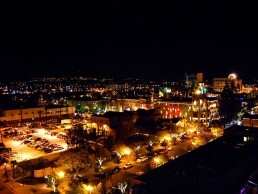 Illuminate Riverside is a free community event that will feature pop-up street improvements that brighten the walk from the Metrolink Station to the Mission Inn on Friday, Dec. 7, from 4:00 p.m. to 8:00 p.m. The event gives residents and visitors an opportunity to test out potential street improvements that make it safer and easier to access downtown Riverside from the train station on foot and by bike. Planned alongside the Festival of Lights, attendees accessing the festival via Vine Street and Mission Inn Avenue will have the opportunity to bypass the shuttle lines to the Festival of Lights and enjoy a festive, lighted, 10-minute guided walk instead. Participants will experience temporary street improvements along Vine Street and Mission Inn Avenue including a lighted tunnel, artistic crosswalks, murals, shared e-scooter lanes and light features that illuminate the 91 freeway underpass. The goal of Illuminate Riverside is to gather public input on these potential street improvements under consideration for the Transit-Oriented Development (TOD) Riverside Marketplace area near the Downtown Riverside Metrolink Station. Future street improvements for the Riverside Marketplace area will seek to improve walkability and bikeability and increase access to transit. Community members are invited to attend this free event via Metrolink, on foot or by bike, scooter or skateboard. Those arriving by car may park at the Downtown Riverside Metrolink Station. Attendees are encouraged to skip the shuttle lines at the Metrolink station and take a short 10-minute walk to the Festival of Lights. Riverside Mayor and SCAG Regional Council Member Rusty Bailey and SCAG President Alan Wapner will speak at a brief kickoff event on Friday at 4:30 p.m. at the Downtown Riverside Metrolink Station parking lot. SCAG’s Go Human campaign works with cities and counties across Southern California to develop open streets events, safety demonstration projects and encouragement programming, such as Illuminate Riverside which promote safety while encouraging people to walk and bike more. Illuminate Riverside is a partnership between the City of Riverside and SCAG’s Go Human campaign, supported by funding from Clean Transportation Funding – Mobile Source Air Pollution Reduction Review Committee. For more information, visit GoHumanSoCal.org/IlluminateRiverside.